The lighthouse keeper's cottage was originally single storey. 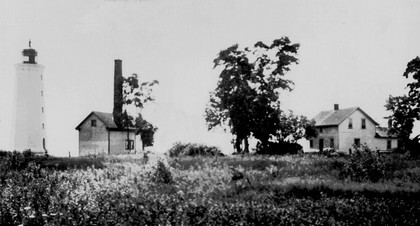 Later a second storey was added, and then removed when the Lighthouse Interpretive Centre was created. Due to a poor choice in building stone, the outside of the lighthouse started to crumble with exposure to the elements. In 1894, it was sheathed in a wood frame and then covered with cedar shakes. 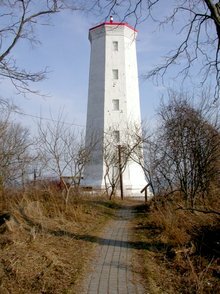 The light was converted to electricity from oil in 1935 and the attractive top cupola was removed by 1965 giving the lighthouse its current profile. The 1907 Canadian list of Lights and Fog Signals indicated the establishment of the fog station at Presqu'ile. It was located close by the lighthouse and the foundations can still be seen by the path from the Interpretive Centre to the lighthouse. The diaphonic alarm produced a blast of six seconds every minute during foggy weather and could easily be heard beyond Brighton over 3 miles away. It was discontinued in 1934 due to a lack of commercial traffic.